Eaglemoss to Expand Range – Consoles Already Confirmed? According to previews world the console range is going ahead with the first one due in July – this must have been in the planning long before the poll came out! 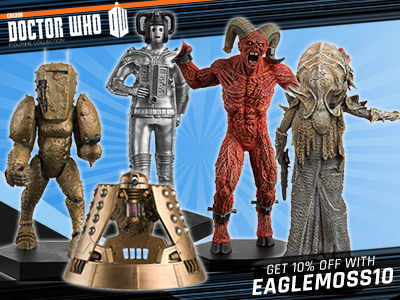 Eaglemoss proudly presents a new addition to the celebrated Doctor Who Figurine Collection. 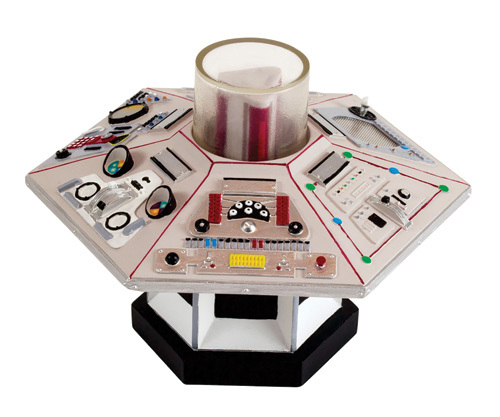 The Fourth Doctor’s console, faithfully finished with all of the screens, switches, and controls seen on screen, is the first to be produced in scale with Collection. The console is made of high quality polyresin, with a removable plastic column in the centre. How Interested in the Console Collection Are You? “Due to the continued success of the Doctor Who Figurine Collection, we are currently looking at producing further product ranges, and would greatly appreciate your help deciding which new concepts we should produce. We have a very extensive Tardis section covering all consoles. You can view it Here. Once you have voted there are other sections to say which, for example, consoles you would be interested in and how many. If consoles were to materialise, would they do TARDIS walls? And the props such as the wooden chair and hatstand? 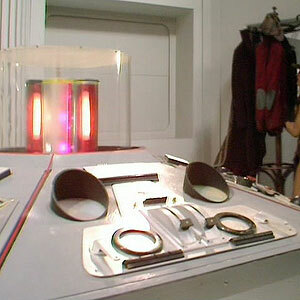 It could become a very good display, all the TARDIS interiors complete with Doctor figurine at the controls. That would very quickly become impractical. No, just the consoles as it’d be silly making all sorts of bits & bobs, too costly as well. Hold up, isn’t that sculpt actually the Season 13 console? From what I recall, isn’t the Season 15 one a lot more metallic? And it didn’t it only have 5 panels? This one looks to me a lot more like the Season 13 version. Am I wrong? There’s never been a five sided console (Dapol aside). He has 3D models of the Season 13 and Season 15 consoles up on his website for comparison. The TV Movie DID NOT have 5 panels. It was the usual 6. The only TARDIS consoles ever to have 5 sides is most of the Dapol consoles (toward the end they did do a 6 panel but it’s like only 50 of theme) and fan console. It would be lovely, if these had been suitable for the 5“ range. But understand they would be very big and expensive. Still a range i would be interested in, along with spaceships and Vehicles, although in conversation at the weekend about this, Things like the UNIT jeep or Landrover, might need approval from the copyright holders of the cars, as they are real vehicles? I know corgi cleared all thier vehicles with the respective auto companies. Eaglemoss have access to the TV Movie. Might be more complicated for original characters originating from it, but pre-existing stuff should be fine. I don’t really think of £20-£25 as expensive, quite reasonable for what your getting. If they do the consoles or TARDIS exteriors how will they do it a part each fortnight or a new 1 every fortnight?? At the prices they’re suggesting I’d prefer one a month but I think it’ll be the whole figure every fortnight if it goes ahead which I’m pretty sure that it will. 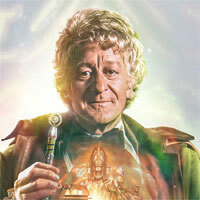 hope they do the rani ‘s tardis control room plus the 11th doctors junk made control room. Would the consoles be in scale with the proper size figure range (5”?) I’m no good with various scales and sorts. It might just about work for Troughton and McCoy’s figures but the consoles will be probably too small for them, they’ll be perfect for the 3.45 figures though. If they did a TV movie console I would buy that no question. I would buy these too! Id rather have a pin collection. I want it too, but I bet it would be really overpriced. Did the survey as I was interested, I voted for exteriors, consoles, Ships and Vehicles, but when I saw the prices, my jaw dropped. They were way to high & when converted from GBP to Australian dollars It was $37 – $58 EACH. Sorry but I haven’t got that sort of money for each figure. I got some of the figures at the start but had to drop them as they got too expensive. I want to see a dalek saucer 2005 onwards, it’s about time we saw that, it’ll go nicely with the dalek emperor from the very beginning of eaglemoss’s collection. I took the survey but it just said how frequent I buy Eaglemoss but I never got any because I’m a TARDIS geek but no voting for a consoles. ??? Me too I answered that then it said I finished the survey. Take it again in a different browser, and use a different e-mail address. I did the same thing, and this sorted it. 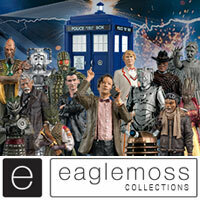 It’s really great to see that Eaglemoss are expanding. The figurines are my favorite possession in the world. TARDIS consoles would be awesome but it will cost a fortune and if just started collecting Legend of Batman. I hope the companions is a separate subscription as i have no faith in them making companions look like the real people. The Doctors were very hit and miss. 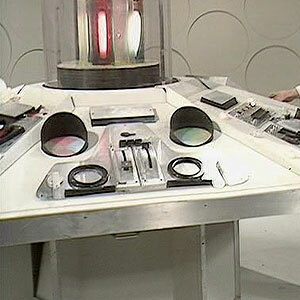 Voted for the Tardis consoles but that is all. spent almost 1.3k todate on collection and we still have 60 figures to go to the supposed end of collection which will take total spend to 2k. 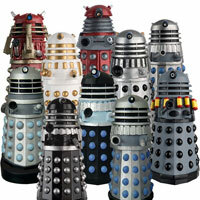 if the tardises or companions do happen i will have to consider collecting the collection. I voted for consoles, TARDIS exteriors, and Space ships…then realised how many varients of each there were and how a second mortgage will be needed !!! I would love to see TARDIS exteriors and consoles! Yes please! That was a fun poll actually, the images helped me envision it quite a bit. I’d love them to make a Pin Badge collection. I’d also like the interior and exterior collection. Ship collection is awesome but space limitations…. I don’t like Pin Badges myself. deffo want to see Clara tardis tribute, American diner, and the Christmas themed tardis from husbands of river song. I voted for ships and TARDIS consoles! However, I want companions added first before any spin off magazines. 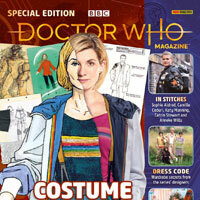 Why not the doctor who magazine comics? Yep, and going on a similar ‘what next’ survey last Summer, Hachette part works, who make The Complete History book series in partnership with DWM publishers Panini, have a possible Graphic Novel/Collected Comics concept that – if it went ahead – would include some of the strips you’re referring to, so it’s unlikely Eaglemoss would be getting the rights to them. Do you have to put your real name into the thingy, I want to vote, but don’t really like using my real name on things. 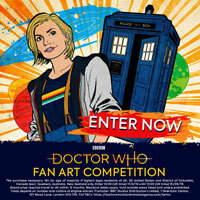 Anyway, I’d be voting for TARDIS consoles or TARDIS exteriors. I really love the different versions of the TARDIS console and while I do not buy the figurine collection because I collect the action figures, I would collect a small run of TARDIS consoles. They aren’t going to know if you put in somrthing made up. 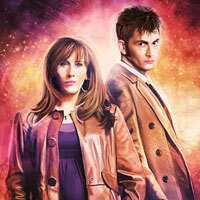 All the Doctor’s Companions need to be added to the figurine series. Also the main friends of the Doctor, like Brigadier Alistair Gordon Lethbridge-Stewart, Kate Lethbridge-Stewart, Osgood, a UNIT soldier from both the Classic Doctor Who era and the New Doctor Who era. Jackie, Wilf, Jenny Flint and Commander Strax etc. 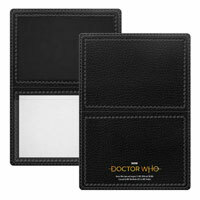 Doctor Who and UNIT t-shirts, hoodies etc and table ware would be great. I strongly disagree that companions need to be added, if they are added I think the best thing would be a seperate line like these suggestion to keep everyone happy. We only have one companion to date if you count Madam Vastra as a companion. Agree! Companions need to be added Now! It’s like they don’t matter or exist. 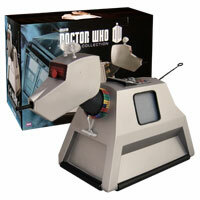 The only companions that matter are K-9 mark 1, The brigadier, Sarah Jane Smith, K-9 mark 2, Susan and Benton. Also, is there going to be a Black Guardian figure? Companions matter to the series of course, but that doesn’t mean Eaglemoss have to make figurines of them. Monsters make for more interesting figurines at that scale especially, and it’s bad enough that we are forced to get repeat Doctors in the main collection, without companions added as well. It’s also worth noting when asked about companions Neil Corry told us to “watch this space” only a week ago so a decision on them may already have been made (so no need for a survey). But whos to say the issues wouldn,t continue above 200. Due to the reactions from the poll etc… I,m sure theres confidence to cater for all and as long as theres interest inthe series , I,m sure BBC Merchandising would authorise the green light on eaglemoss+ products. Are they near the end of the figurine range now? Have they produced figures such as Shockeye, Rills, Fish People, and all the companions yet? Oh I hope they do the fish people they are one of my favourite second doctor monsters. 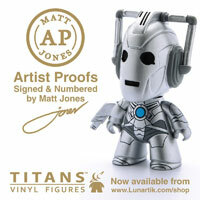 There’s still lots of figurines left, they are looking to branch out extra ranges, not replace their existing range. That is also how I voted. The TARDIS exteriors and consoles would be great!